Iowa CTS Cleaners is a locally owned decontamination, cleaning, and restoration service based in Grimes, IA. Founded by a US Marine, we understand the need for competent and considerate service in traumatic circumstances. 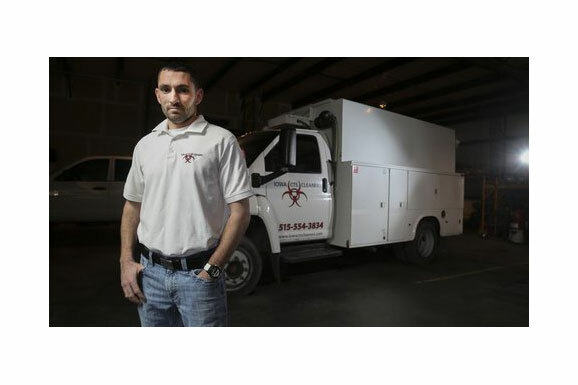 Unlike other cleaning and restoration companies that have a wide range of focus, Iowa CTS Cleaners specializes only in trauma scene cleaning and restoration. We understand and know good customer service so when you call us you’ll speak one on one with a specialist not a call center. It is our job to help Iowa families return their homes back to the safe place they once were. 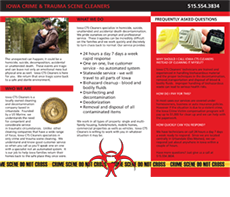 Iowa CTS Cleaners specialize in homicide, suicide, unattended and accidental death decontamination. We pride ourselves on prompt and professional service. These tragedies can be incredibly difficult on the families and we work quickly and discretely to turn chaos back to normal.